Omanawa Power Station closed in 1998 after 83 years of service. "In order to harness this Fall a tunnel should be driven some little distance above to a short distance below the Fall along one side of the gorge. The Power House would be built about twelve feet above the level of the pool in a cavity excavated in the side of the gorge. The water would be conveyed through the tunnel, thence through a vertical penstock direct to the turbines and discharged into a tail race built in the form of a tunnel below the power house. By this arrangement the whole of the headworks as well as the power house would be protected from injury in the event of slips occurring in the vicinity of the Falls. The entrance to the tunnel would be protected from floating debris by an iron grillage, and leaves and sticks etc. would be prevented from getting into the turbines by an arrangement of screens which would be cleared daily if necessary. As most of the construction would be in concrete the work would be of a very permanent nature. Two generating sets, each consisting of a high speed turbine direct coupled to an alternating generator, would be installed. Each set should be capable of developing about 120 hp. Until the demand exceeds the capacity of one set the other would be considered a standby, but when it becomes necessary to run both it would be advisable to install a third set. Each turbine would be controlled by means of a sensitive governor." 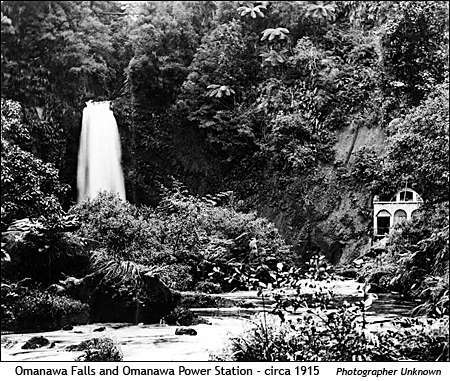 The cost estimated for the Omanawa Falls Station was $21,260 and the annual costs including interest and depreciation were estimated at $3,304. He estimated that after three years the annual revenue would be $3,490 of which the main component would be 150 homes utilising 24,750 units at 8c. per unit ($1,650) motors etc. would utilise 60,000 units at 2 c. per unit totalling $1,000. In October, 1914 approval was obtained from the Public Works Department to take water from the Omanawa River to generate electricity and circulate the same throughout the Borough and part of the County. Omanawa Station was completed on 28th August, 1915 when Mr. H. R. Climie (Henry "Harry" Richmond Climie), with Mr. H.M. Millar, Assistant Electrical Engineer of the Public Works Department, commenced commissioning tests. On 2nd October, 1915 the Borough was lit up for the first time with electrical street lights replacing the existing gas lamps. The output from Omanawa was carried to the Borough on a three phase 11 kV line. 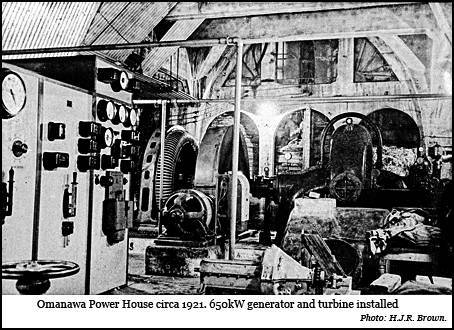 In 1921 a turbine from a mining battery at Karangahake and a 650kW generator were installed, the head being increased to 33.5 metres. A transept to the underground station was excavated, the roof of rhyolite rock being supported at the intersection by diagonal arches as can be clearly seen in the photograph on the right. For over fifty years this was the only underground station in New Zealand. The increase in capacity of the Omanawa station from approximately 150kW to 600kW was designed by and carried out under the direction of the Tauranga Borough Engineer, Mr. Lloyd Mandeno. 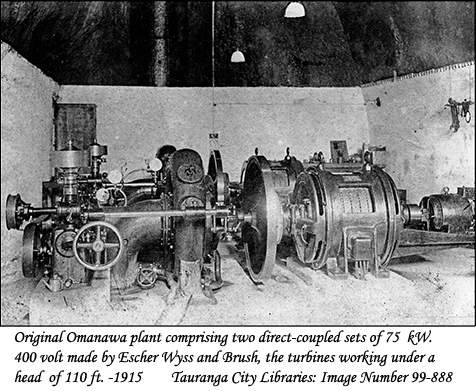 In 1998 TrustPower Omanawa Power station was gifted to the Tauranga City Council. The station remained idle and subject to vandalism until a Te Kuiti hydro-electric entrepreneur Michael Davis negotiated a 35-year lease from the council in 2007. The turbine and generator originally powered a gold quartz crushing plant in the Karangahake Gorge. The 108-year-old Swiss-made Escher Wyss turbine was restored by Bay Engineer Jim Berryman. However the generator was unsalvageable and had to be replaced by a more modern unit. The station began generating power again in November, 2008. Water from the Omanawa River drives the turbine through a 180m tunnel from the inlet, to a surge chamber carved out of rock, and then a further 33m tunnel to the powerhouse. Power generated is tied into the local Power Company's Kaimai feeder, supplying power to households on Omanawa Rd and further up the Kaimai area. The spring-fed river's constant flow means that power output is also constant, without the usual seasonal fluctuations associated with other small hydro-electric stations in the North Island. Output is 200 kilowatts, producing 1.5 million units of electricity a year. 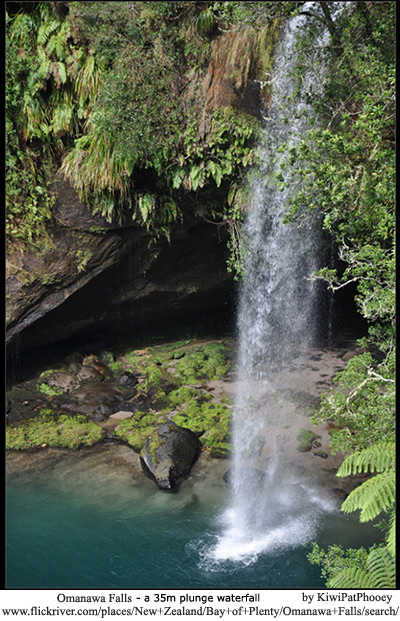 A condition of the lease for taking water from the river is to ensure there will always be a good flow over the scenic Omanawa Falls - the power station is carved into the ravine off to one side of the falls.